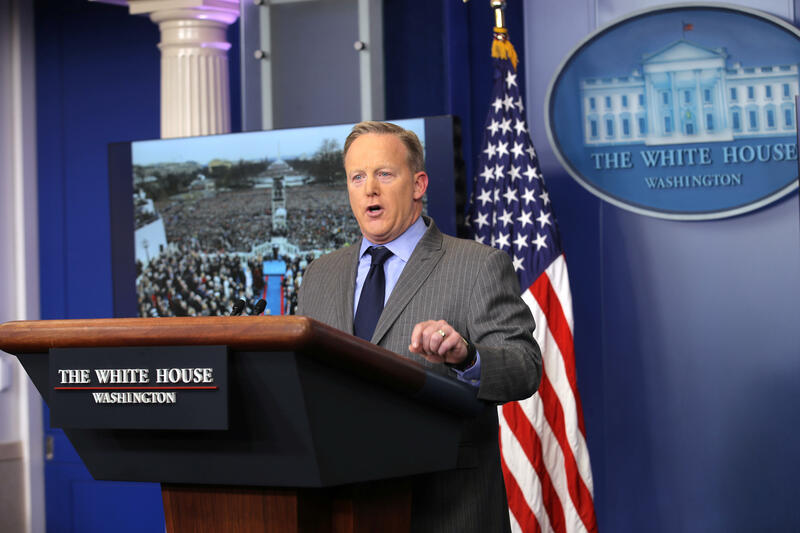 White House press secretary Sean Spicer came to the briefing room Saturday to chastise journalists for their coverage of attendance at President Trump’s inauguration before leaving the briefing room without taking any questions. “Some members of the media were engaged in deliberately false reporting,” Spicer said, calling out two examples on Twitter of “inaccurate numbers involving crowd size” as well as reporting from a Time magazine journalist that a bust of Martin Luther King Jr. had been removed from the Oval Office. Protests against President Trump break out across the U.S.
“Inaccurate numbers involving crowd size were also tweeted,” Spicer said, his voice escalating in volume. “No one had numbers...because the National Park Service does not put any out.” He said the same applied to “any attempt to count the protesters today,” referring to the Women’s March on Washington that packed the National Mall area. The newly minted press secretary didn’t only target the media: Spicer also lobbed attacks at Senate Democrats, who he accused of “stalling” the confirmation of Mike Pompeo, Mr. Trump’s CIA pick. At the briefing, Spicer also laid out the president’s upcoming schedule, mentioning that British Prime Minister Theresa May will visit the White House in the next week. The press secretary announced that Mr. Trump spoke with Canadian Prime Minister Justin Trudeau and Mexican President Enrique Pena Nieto Saturday. To the Mexican leader, Mr. Trump discussed holding a visit on trade, immigration and security that will occur on Jan. 31. Earlier in the day, Mr. Trump complained at an appearance at the CIA about network coverage suggesting that his crowds were thin. Media coverage of the inauguration crowds relied on aerial photos of the two addresses from the opposite end of the National Mall to draw comparisons, with President Obama’s 2009 inauguration apparently drawing much denser crowds. Spicer made no reference of aerial photos in the briefing, using instead two photographs from behind the Capitol, an angle from which the disparity is not as clear. On Friday evening, the National Park Service was ordered by the Interior Department to cease tweeting after a staffer retweeted a reporter’s comment on the sparser crowds that appeared to attend Mr. Trump’s inauguration. About 30.6 million people watched the inauguration, according to the Nielsen ratings, a smaller number than the 38 million who watched Mr. Obama’s first inauguration in 2009.